This is Day 29 of 31 Days of Intentional Community, in the form of a post on a new blog where I am a contributor. I hope you'll head there to read it! As I mentioned a while back, I recently joined a new team of writers on the newly re-launched blog, One Fun Mom. So far getting to know those ladies in our Facebook group has been, well, fun! Today I have my first post up, and I wanted to write one that coincided with the topic of living in community. I'm exploring the fact that our culture tends to be pretty closed-door these days, but that if we want to really find authentic community, we need to be willing to open up our doors-- the doors of our heart and the doors of our home. 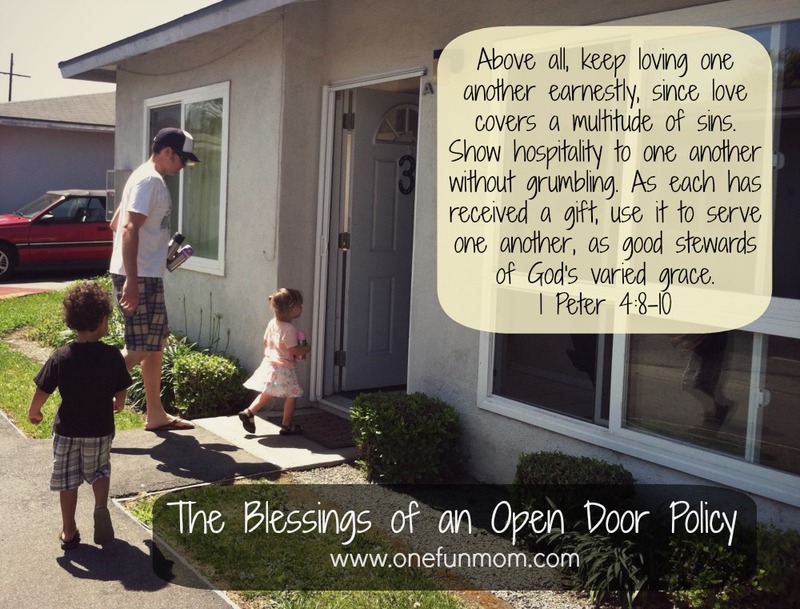 Over in the post, I'm talking about why having an open door policy is a not a burden but rather a blessing, and also how we can cultivate that mindset in our hearts and in our homes. Join me over at One Fun Mom to read the post!